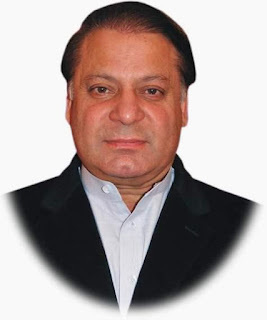 Mian Muhammad Nawaz Sharif was born on December 25, 1949 in Lahore, Punjab, Pakistan. He is the eldest son of Muhammad Sharif. Nawaz Sharif got his schooling from Saint Anthonys High School. After graduating from Government College Lahore, he obtained his Law Degree from the Punjab University. Nawaz Sharif remained a member of the Punjab Provincial Council for some time. He joined the Punjab Cabinet as Finance Minister in 1981. He first became Prime Minister on November 1, 1990, running on a platform of conservative government and an end to corruption. His term was interrupted on April 18, 1993, when President Ghulam Ishaq Khan used the reserve powers vested in him by the Eighth Amendment to dissolve the National Assembly. Less than six weeks later, the Supreme Court overruled the President, reconstituting the National Assembly and returning Sharif to power on May 26, 1993. Nawaz Sharif resigned from office along with President Ghulam Ishaq Khan on July 18, 1993, after his feud with the president, who had accused him of corruption. Moin Qureshi became caretaker prime minister, and was succeeded shortly thereafter by Benazir Bhutto, who was elected to office on October 19, 1993. Nawaz was returned to power in February 1997 with such a huge majority that the result was immediately questioned by Bhutto Pakistan People Party. One of the first things Sharif did at the start of his second term was to orchestrate the scrapping of Article 58-(2)(b) through another Amendment to the Constitution &ndash; an exercise in which Sharif party was joined by all the other political parties in the National Assembly and Senate. The Thirteenth Amendment to the Constitution of Pakistan was passed so that the President could no longer dismiss the Prime Minister; and the Fourteenth Amendment imposed so-called party discipline on members of Parliament. Party leaders now had unlimited power to dismiss any of their legislators if they failed to vote as they were told. This made it impossible to dismiss a prime minister by a motion of no confidence. In effect, the two amendments removed nearly all checks on the Prime Minister power, since they removed all legal remedies to dismiss him. He opposed the independence of the judiciary, clashing with the Chief Justice, Sajjad Ali Shah. The Supreme Court was stormed by Sharif party loyalists on November 28, 1997, and the Chief Justice was forced to resign. On the development front, Nawaz Sharif completed the construction of South West Asia first motorway, the 367 km M2, linking Lahore and Islamabad. The motorway, which was initiated during Nawaz Sharif first term, was inaugurated in November 1997 and was constructed at a cost of Rs 35.5 billion. The peak of his popularity came when his government undertook nuclear tests on 28 May 1998 in response to India nuclear tests two weeks earlier. However, after these tests, matter started going downhill. He suspended many civil liberties, dismissed the Sindh provincial government and set up military courts when the stability of the government was threatened. He was accused of cronyism and being too supportive of Punjabi candidates for office, which marginalized his party in the south. During his first term as prime minister, Sharif had fallen out with three successive army chiefs: with General Mirza Aslam Beg over the 1991 Gulf War issue; with General Asif Nawaz over the Sindh &ldquo;Operation Clean-Up&rdquo; issue; and with General Waheed Kakar over the Sharif-Ishaq imbroglio. At the end of General Waheed three-year term in January 1996, General Jehangir Karamat was appointed army chief. His term was due to end on January 9, 1999. In October 1998, however, true to form, Sharif fell out with General Karamat as well, over the latter advocacy of the need for the creation of a National Security Council. In October 1998 General Karamat resigned and Sharif appointed General Pervez Musharraf as army chief (the first person to become army chief from the minority group of Urdu speaking people). He would later regret appointing Pervez Musharraf to the Chief of Army position, as Musharraf would lead a coup to topple Sharif government.